The U.S. Navy's next Virginia-class attack submarine will bear the name USS New Jersey, says AP reports. U.S. Secretary of the Navy Ray Mabus hosted a ship-naming ceremony over the weekend in Jersey City, New Jersey, to announce that SSN 796, a Virginia-class attack submarine, will bear the name USS New Jersey. 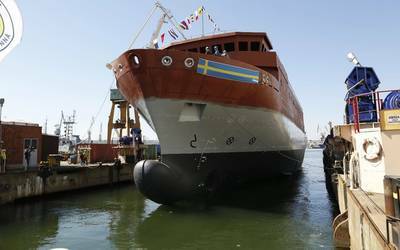 The vessel itself will be seaworthy by 2021, Mabus estimated. It is a nuclear-powered vessel that will never need refueling and should serve in the fleet for 40 years, Mabus said. The Navy secretary also said that the Virginia Class attack sub is the most advanced submarine in the world, "by far." "New Jersey has a long history in the creation of the modern day submarine," New Jersey Senator Robert Menendez said referencing John Philip Holland, the Irish engineer who designed and built the first submarines in Elizabeth, New Jersey. "I felt that as we are creating a new class of submarines it was time New Jersey got recognition." Two battleships have been named the USS New Jersey previously. The most recent one was decommissioned in 1999 and is now docked in Camden and open for tours.